Tool and die designer and builder DTC Products, a division of Dec Tool Corp., St. Charles, IL, has developed a slug-retention machine that prevents slugs from pulling back onto the die block. The machine uses a pneumatically powered grinder to precisely machine a small angled groove into the sidewall of a stamping-die cavity. 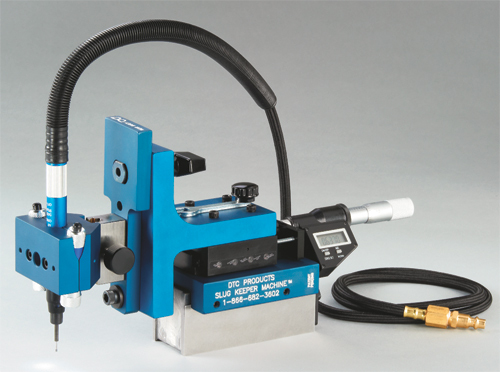 A micrometer coupled to the drive of the machine’s slide enables precise movement of the machine’s carriage to control the depth of the slug-retention groove. The machined groove creates a precise amount of interference. During stamping, the slugs expand into these grooves, which prevents them from pulling back up to the top of the die block and onto the die surface, where they can damage the strip, the final part or even the die. This solution helps reduce downtime by eliminating the need to stop the press and remove slugs from the die and stripper surface. It also eliminates the significant costs associated with sorting parts in search of slug marks. The slug-retention machine measures less than 10 in. high, and features a magnetic base so it can mount temporarily but firmly in place on the die surface during the grooving operation. Use it to also machine grooves into die bushings and die inserts, as well as to vent guided stripper openings. At less than 10 lb., this unit is easily transportable within a sturdy carrying case, so stampers can use it in the toolroom or pressroom to work on dies while mounted in the press. Only a compressed-air connection is required for operation.